This page in the problem solving web site is here primarily as a reminder of some of the usual definitions and theorems pertaining to circles, chords, secants, and tangents. Some of the entries below could be examined as problems to prove. Mainly, however, these are results we often use in solving other problems. 0. Definition: The measure of an arc of a circle is equal to the measure of the central angle that intercepts the arc. 1. Inscribed angle theorem. The measure of an inscribed angle is equal to one-half the measure of its intercepted arc. 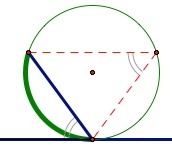 The usual proof begins with the case where one side of the inscribed angle is a diameter. Then the central angle is an external angle of an isosceles triangle and the result follows. Situations where a side of the inscribed angle is not a diameter can be reduces to the former by appropriate auxiliary lines. 2. An angle inscribed in a semicircle is a right angle. The intercepted arc is a semicircle and therefore has a measure of equivalent to two right angles. Since the inscribe ange has measure of one-half of the intercepted arc, it is a right angle. 3. The measure of an angle formed by a tangent and chord is equal to one-half the measure of its intercepted arc. A useful pair of auxiliary lines is to contruct an isosceles triangle with one side parallel to the tangent line. 4. If two chords intersect to form the the vertex of an angle within a circle, the measure of the angle is equal to one-half the sum of the measures of the two arcs intercepted by the angle and its vertical angle. A prudent auxiliary line is a chord connecting two of the endpoints of a chord, forming a triangle for the vertical angles are exterior angles of the triangle. 5. If two secants intersect to form thevertex of an angle outside a circle and the sides of the angle intercept arcs on the circle, then the measure of the angle is equal to one-half the difference of the measures of the arcs intercepted by the sides of the angle. A prudent auxiliary line is a chord connecting points of intersection of the sides of the angle with the circle as shown at the right. 6. If inscribed angles of a circle intercept the same arc then they are congruent. This follows from the Inscribed Angle Theorem. 7. If two chords intersect within a circle, the product of the measures of the segments of one will be equal to the product of the measures of the segments of the other. 8. If a tangent segment and a secant segment are drawn to a circle from an external point, then the square of the measure of the tangent segment is equal to the product of the secant segment and its external portion. 9. If two secant segments are drawn to a circle from an external point, then the product of the measures of one of these segments and its external portion is equal to the product of the measures of the other with its external portion.